Little Philae is awake! ESA sent a wake-up call to the 100-kg (220-lb) lander riding aboard the Rosetta spacecraft this morning at 06:00 GMT, bringing it out of its nearly 33-month-long slumber and beginning its preparation for its upcoming (and historic) landing on the surface of a comet in November. Unlike Rosetta, which awoke in January via a pre-programmed signal, Philae received a “personal wake-up call” from Earth, 655 million kilometers away. Hello, world! ESA’s Rosetta and Philae comet explorers are now both awake and well! A confirmation signal from the lander was received by ESA five and a half hours later at 11:35 GMT. After over a decade of traveling across the inner Solar System, Rosetta and Philae are now in the home stretch of their ultimate mission: to orbit and achieve a soft landing on the inbound comet 67/P Churyumov-Gerasimenko. It will be the first time either feat has ever been attempted — and hopefully achieved — by a spacecraft. After Rosetta maneuvers to meet up with the comet in May and actually enters orbit around it in August, it will search its surface for a good place for Philae to make its landing in November. With a robotic investigator both on and around it, 67/P CG will reveal to us in intimate detail what a comet is made of and really happens to it as it makes its close approach to the Sun. Meanwhile, today’s successful wake-up call let the Rosetta team know Philae is doing well. Further systems checks are planned for the lander throughout April. 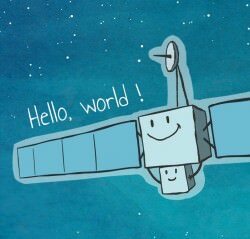 Want to welcome Rosetta and Philae back on your computer? Download a series of ESA’s “Hello, World” desktop screens here. If they pull this off it will be one of the neatest things ever done with a space probe. But … if the comet is a loose agglomeration of rubble, will the anchor hold?